This guide offers information on the most beautiful villages near London. England is famous for its picturesque villages, and visiting these tranquil countryside destinations can be a welcome break from the noise and frenzy of London. Whether you’re thinking of moving out of town to a quieter place you can commute from, or you’re just looking for somewhere to take a short relaxing break, these villages should not be missed. Limpsfield is a village in East Surrey, at the foot of the North Downs. It’s surrounded by beautiful National Trust land, as well as containing Staffhurst Wood, known for its impressive bloom of bluebells in the spring. There are approximately 20 medieval buildings and 89 listed buildings in the parish, including the Old Court Cottage, which has been described as an outstanding example of an early timber framed building. Ardeley is a small picturesque village in East Hertfordshire. It houses neat thatched cottages alongside a traditional village hall and churchyard. There’s a striking grade-one listed church dating to around the 13th century, and a lovely little church farm. The farm allows visitors to buy produce and feed the animals. Bawdsey is a coastal village in Suffolk that is known for its WWII defences. The village is a short distance from Bawdsey Manor, which was built in 1886 and used as a research station after WWI. It’s now primarily used as a wedding venue, as well as housing a small museum in the Radar Transmitter Block. Bawdsey is also home to Alexanders International School: a boarding school offering summer school holiday courses, as well as international GCSE courses and pre-sessional A-level short courses. If you want to find out more information about the school, visit www.alexandersschool.com. Finchingfield is situated in the Braintree district of Essex. It’s regarded as a ‘picture postcard’ village and is one of the most photographed in England. It has won many prizes for its prettiness, with its tranquil duck pond and village green surrounded by quaint cottages. It also houses an 18th century windmill and The Red Lion: a 15th century coaching inn, offering traditional British food and a selection of real ales. Wye is a historic village in Kent, located 12 miles from Canterbury and a short distance from the seaport of Hythe. It’s surrounded by open countryside full of water-meadows, wildfowl parks and ancient windmills. 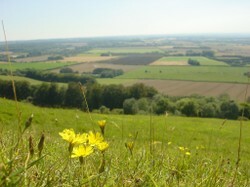 On the Downs, east of the village, is a chalk crown that has been carved into the hillside. It was created by students in 1902 to commemorate the coronation of Edward VII. A farmers’ market is held twice a month, and there’s an annual summer festival of blues music and real ale. Alfriston, in East Sussex, is a village positioned in the Cuckmere Gap, surrounded by the South Downs and the beauty of the Cuckmere valley. It houses many old buildings, including the Star Inn, believed to be one of the country’s oldest inns. The inn has a beautifully preserved interior and is decorated externally with interesting carved faces and figures. All of these villages represent the quiet beauty of England’s countryside, and make a welcome break from a hectic London lifestyle. Relax in a picturesque setting or take inspiring walks through fields and woodland. What attracts you to village life? Unfortunately made the mistake of being guided by this article on 6 of the most beautiful villages near London and made the not so easy trip to Ardeley, what a complete waste of time. Westmill which is nearby is far nicer and very easily accessed off the A10. In my opinion ! !